There is definitely a peak season for the most dramatic migration – across the Mara River, which runs roughly between the Serengeti in Tanzania and the Mara in Kenya. In a typical year that might be from around July to September going North, and not long after that, returning south. 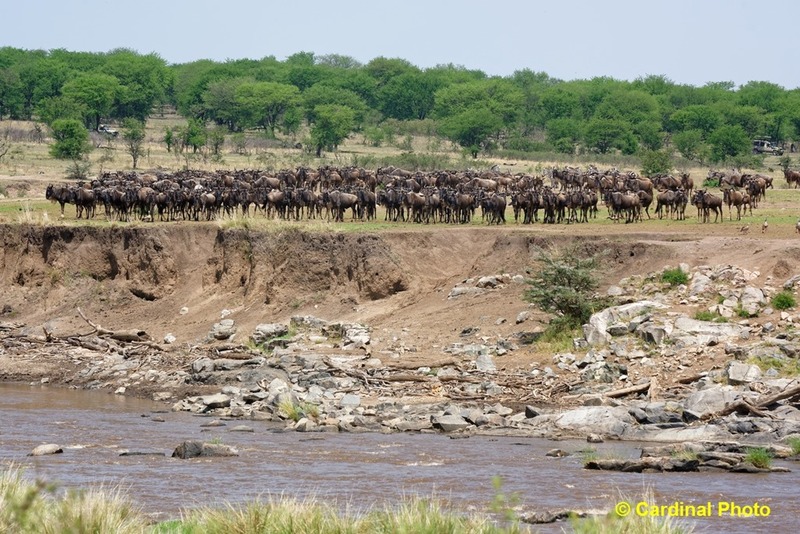 However, this year the migration was at least three weeks early, so during our visit in late September all the crossings and near-crossings we witnessed were from North (where the Wildebeest and Zebra go after the Serengeti Plains dry out) to the South (where they return after the rains start). 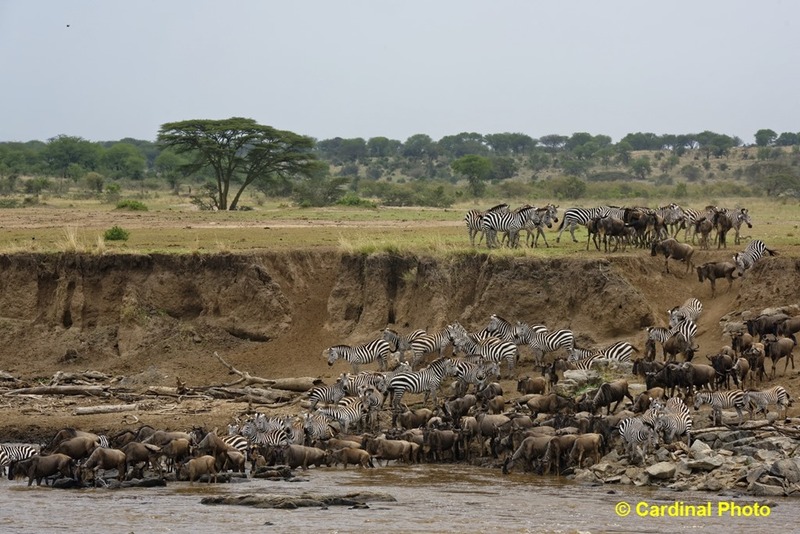 The overall migration is a much larger cycle, involving the vast expanse of the Southern Serengeti and the more varied terrain of the Western Serengeti, but those areas don’t feature the steep-banked Mara River which makes for the dramatic crossings. 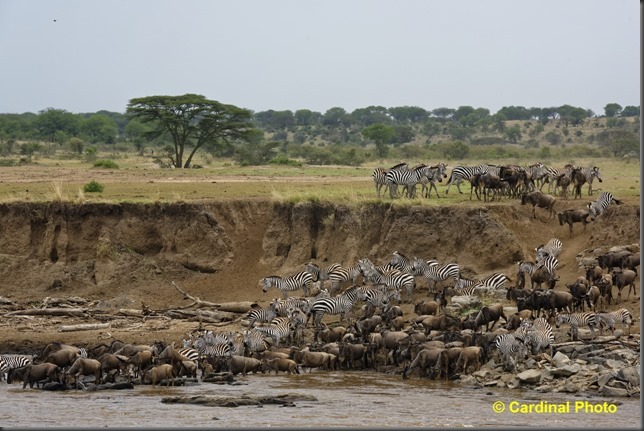 Unlike the bird and bat migrations most of us think of when we hear the term migration, the Wildebeest and Zebra migration is much more opportunistic. The animals can cross and re-cross the Mara River, for example, 10 or even 20 times in a single season. They are drawn by the smell of rain, so if they smell better grazing on the other side of the River after a rainstorm, they may well cross. A change in rain patterns and they may cross back. Ultimately most of them do wind up continuing onward, away from the River, but some stay near there each year. 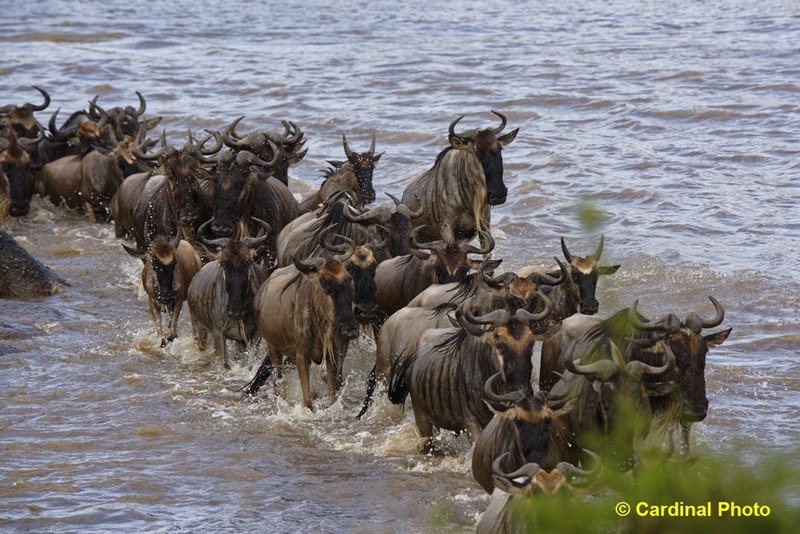 Also unlike most migrations, the Wildebeest are often in no hurry to move from one side of the river to the other. 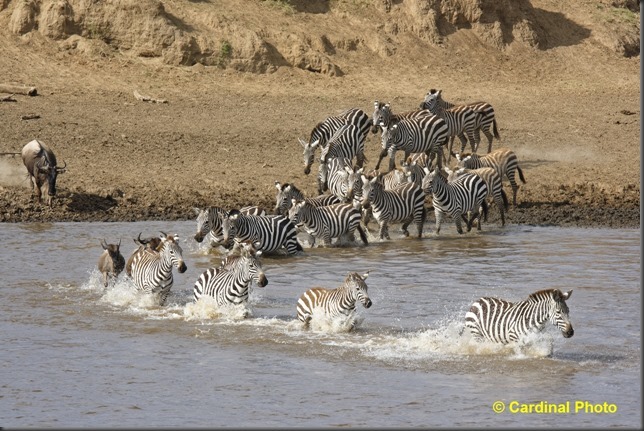 They often gather on the bank in large groups, perhaps with a few individuals testing out the water’s edge, only to move away and go back to grazing. So you can’t just show up at one of the crossing areas along the River (of which there are at least a dozen) and expect action. It is best to set aside some time to watch and wait. 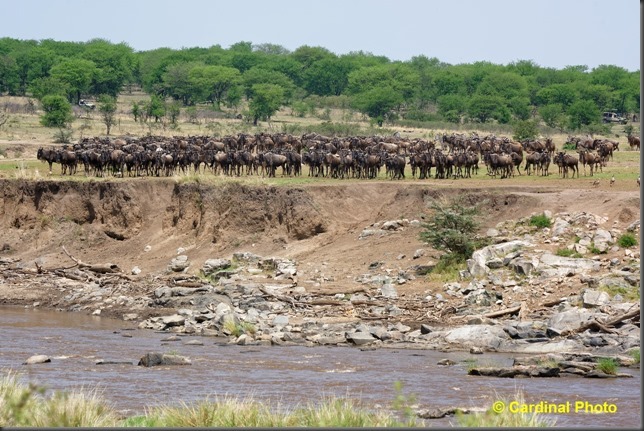 It is actually almost as much fun to sit perched on a hill above the river and watch the groups of animals form and reform as it is to watch them cross. We spent most of the day above the river one day, complete with a nice picnic lunch. Our patience was rewarded with two crossings that day – although neither occurred until after 3pm – so it was great that we had the time to wait them out. Crocodiles don’t need to eat very often, so after the beginning of the migration, where they make up for some lean months, most crocs aren’t really that aggressive about going after the crossing animals. 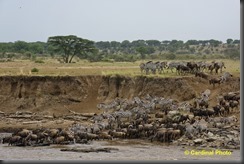 Of course, when they do it is exciting to watch, and we certainly saw a couple Wildebeest calves grabbed by crocs in one of the crossings we witnessed, but in others every animal made it safely across.